STARRING Sir Ian Holm, Mickey Rourke, David Warner, Gary Cady Alan Barker, Billy Boyle, and Stephen Brennan. 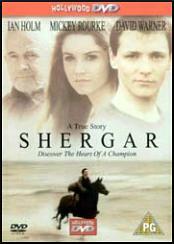 SYNOPSIS Based on the real life story of Shergar, a Derby winning race horse stolen in 1983, by IRA terrorists. In the film the plot was lead and carried out by Gavin O'Rourke and Dermot Concannon who bring the horse to the farm of IRA sympathiser Eammon Garritty. There Kevin Doherty, a stable boy who ran away from reform school, takes care of the horse. Kevin is the orphaned son of a jockey, who dreams of being like his father was. Sadly the Irish Authorities refuse to pay the 5 million ransom for the horse and Shergar is faced with being shot till Kevin races him away to safety. Now on the run, Kevin disguises the horse and lays low with some new friends, while the terrorists are hot on his heels.